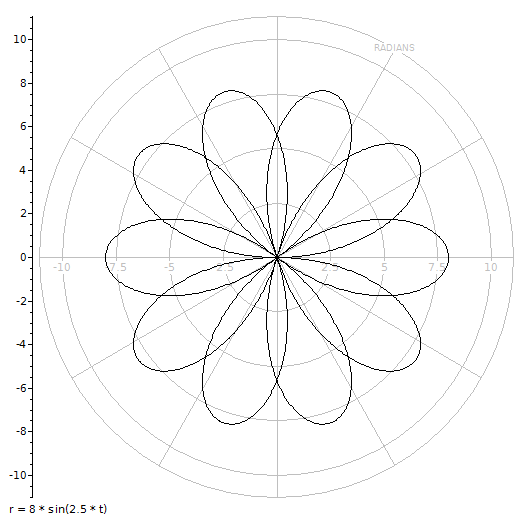 This screenshot shows the Graphing & List Window being used to generate sine and cosine function plots. An integral calculation is also shown for plot A. These plots can be generated using the input parameters below. 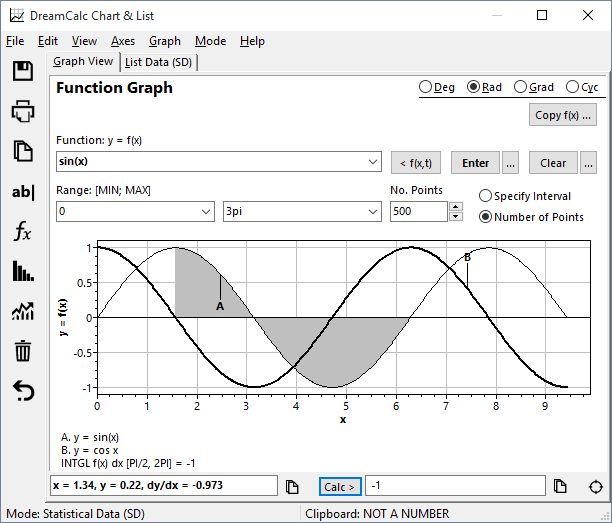 See Graphing a Function for more information. Click the Calc button and then select Integral of Plot A to perform the integral calculation. The SIGN function converts sine into a square wave, while RAND adds "noise". The noise will change each time you plot the function. Use Interval, not "No. Points" so as to create a discontinuity at x = 0 (i.e. 1 / 0 → INFINITY). The "equation of time" approximates the difference between the apparent time and mean time (i.e. between solar noon and noon on the clock) throughout the year. The difference is due to a combination of the obliquity of the Earth's rotation axis and the eccentricity of its orbit. Below is the Polar Rose — a famous polar plot that looks like a petalled flower. Enter the above equation and select: Axes→Polar Plot. Below, a scatter plot of X-Y data with a line of best fit, as determined by cubic regression analysis. 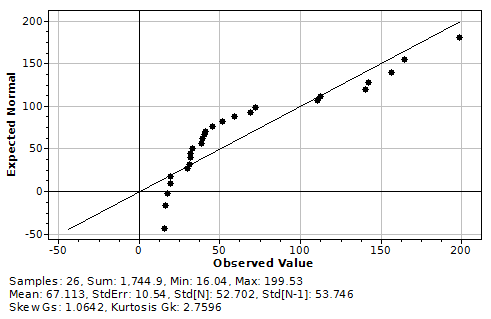 Select: Chart→X-Y Data Charts→Show Regression Fit to show best fit. 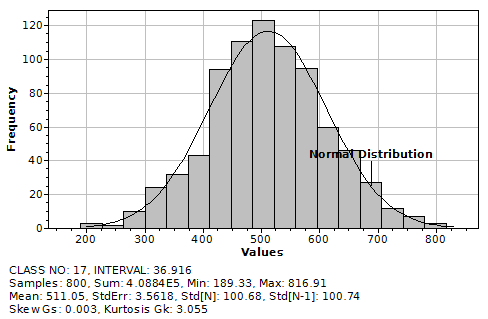 Below is a histogram generated using data in the DreamCalc SD Data List. 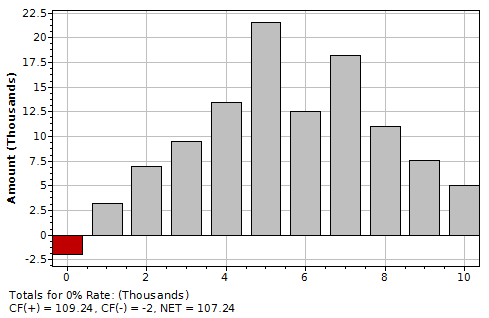 The second chart shows a cumulative plot of the same data. The actual data values used to generate these plots can be found in the notes below. 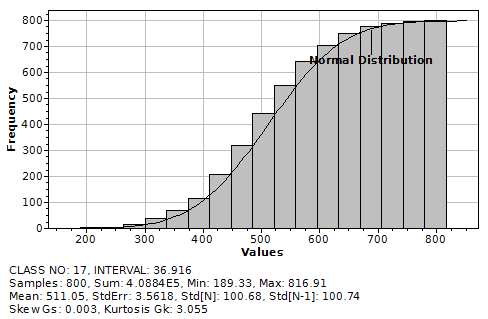 Select: Axes→Cumulative for the cumulative variation. Professional Edition Only. A Normal Quantile-Quantile Plot generated using data in the DreamCalc SD Data List. 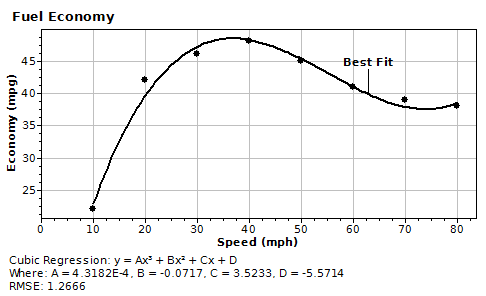 The actual data values used to generate this plot can be found in the notes below. Professional Edition Only. The chart below shows cash amounts held in the cashflow list — a separate data list used in the financial calculations supported by the Professional Edition of DreamCalc. Any - cashflow data is independent of other lists.